Spring has a tag library that helps you in building forms. It also has a tag called errors that lets you output validation errors in a formatted way. However, this tag has some limitations. When multiple errors are displayed at the same time, you can only control the styling of the outside container and not the styling of each of the errors. So for example it is not possible to display the error messages as an unordered list. This tutorial describes how to create a custom errors tag that has some extra customization attibutes compared to the basic Spring form errors tag. Creating a Tag Library with our custom tag definition in it. Creating a custom class that specifies how our new tag will work. Include the tag library in a sample JSP and use it to display errors. A tag library definition is contained in a .tld file and also each tag has a class which contains the logic that results in some kind of output when we use the tag. We are using the basic Spring error tag’s definition as a starting point, but add two extra attributes to it. The added attributes are highlighted in the code below. One of the new attributes is innerElement. It can be used to specify an HTML element that will be used to wrap every single error message individually. The other new attribute is the innerElementCssClass. This specifies the CSS class or classes that will be applied to each of the inner wrapping elements. The other attributes are just copied from the original Spring form errors tag. The tag class specifies what kind of output will the tag produce based on it’s attribute values. Here is the full class for the new tag. * css class which wraps every individual error item. You can see that it extends the basic error tag (org.springframework.web.servlet.tags.form.ErrorsTag). We override the renderDefaultContent method that creates the output of the tag. Anything that you pass to this method will be appended to the output produced when someone uses this tag. As you can see the extra logic that we have added is pretty simple. We just print an opening and closing tag around each error if the user provided the innerElement attribute and we also add the CSS classes to the opening tag if the innerElementCssClass attribute is specified. We have also set up some extra methods, but they are just there to simplify the renderDefaultContent method. The outer element that encloses all the errors is just displayed the same way as it was in the super implementation (startTag, endTag, writeDefaultAttributes calls). 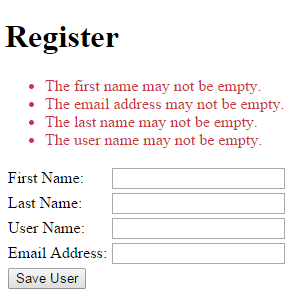 For demonstration purposes I have created a very simple registration form that uses the newly created tag. Notice the taglib definition with the taglib directive and the usage of our new jtuts:errors tag. For the sake of completeness I also show you the remaining parts of the sample application. I just included the minimum dependencies required for this project. I also used the Tomcat Maven plugin to be able to deploy the app easily. This is what the working application looks like when we try to submit an empty form. Notice that we are displaying the error messages as an unordered list which was not possible with the original version of the errors tag. You can download the whole working source code from here.